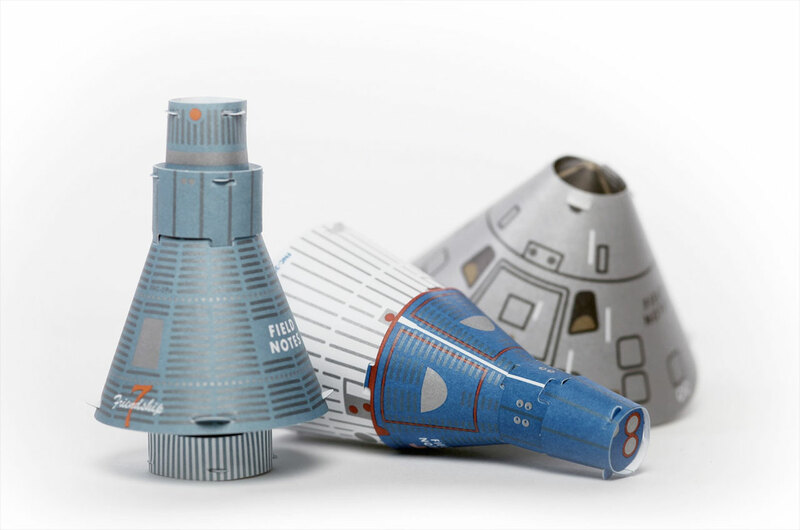 — A novelty stationery company has taken note of the approaching 50th anniversary of the first moon landing and has launched a trio of memo books and paper spacecraft models in celebration. 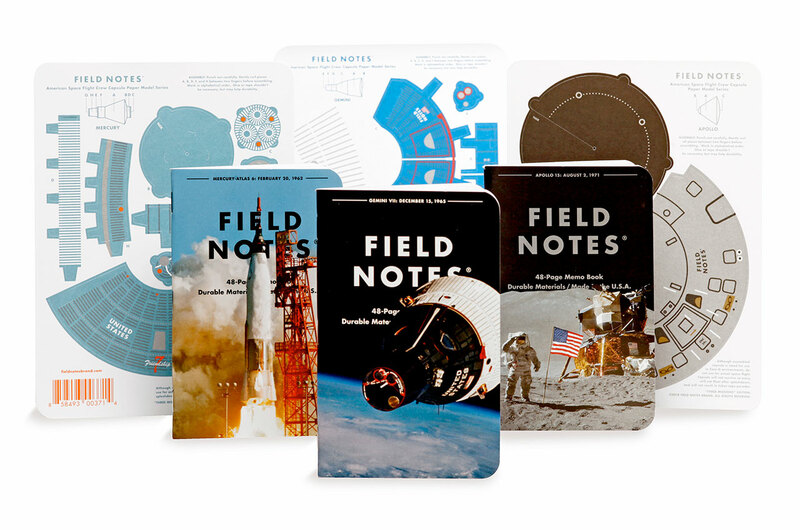 Field Notes, which produces collectible notepads reminiscent of the promotional memo books distributed to American farmers by agricultural companies, has themed its 39th limited edition to the "Three Missions," NASA's Mercury, Gemini and Apollo programs. "Fifty years ago, America was in the midst of a historic quest to land a man on the moon," explains Field Notes on its website. "Our 39th quarterly release, the 'Three Missions' edition, celebrates the programs that got us there." The "Three Missions" set features a three-pack of memo books — one each for Mercury, Gemini and Apollo. Each includes facts and figures about the particular early human spaceflight program, researched with the help of NASA and the Jet Propulsion Laboratory (JPL). Field Notes' Mercury book features on its cover a photo of John Glenn's 1962 Atlas rocket launch. The Gemini cover reproduces a photo taken by Gemini 6 of Gemini 7 during the first rendezvous between two crewed spacecraft in 1965. Astronaut Jim Irwin appears on the cover of Field Notes' Apollo memo book, which features a photograph of the Apollo 15 moonwalker on the lunar surface in 1971. Each 48-page, 3.5-by-5.5-inch (9-by-14-centimeter) notebook also includes blank white graph paper with a "dusting" of "Firmament Gray" ink to form the rule lines. "Those pages will be helpful in planning a summer picnic, or calculating optimal orbital trajectories and eccentricities," suggests Field Notes. As a bonus, the books also come packaged with three "punch-out and assemble" Mercury, Gemini and Apollo capsule models. "Now keep in mind that these models will not survive re-entry into the atmosphere, probably won't float after splashdown and are unlikely to earn you a ticker-tape parade," advises the company. But they are "for fun and education," notes Field Notes. 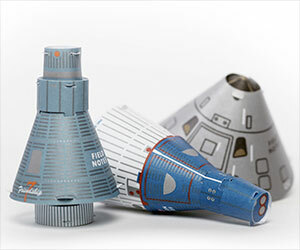 Once assembled, the card stock kits form 1:50 scale models of Glenn's Friendship 7 Mercury spacecraft, a Gemini capsule and an Apollo command module. 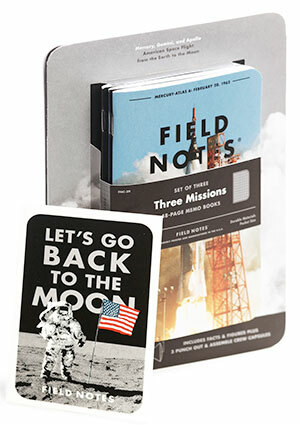 Field Notes produced 50,000 sets of the "Three Missions," which it is now marketing for $12.95 per pack. The company also offers an annual subscription to its quarterly editions, which if chosen also includes a water transfer decal with a "Let's Go Back to the Moon" design. Uncut press sheets of the "Three Missions" covers and model sheets, suitable for framing, are also for sale, but are limited. 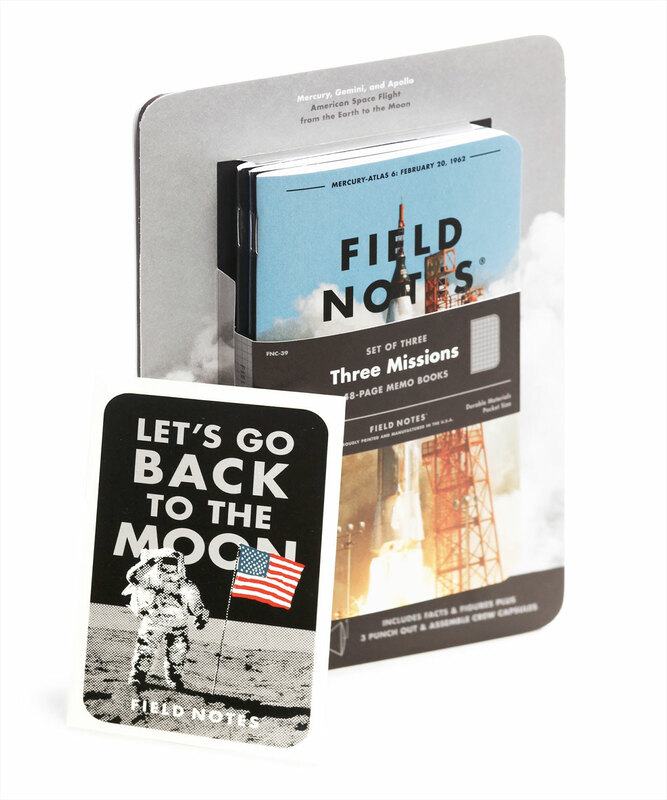 The "Three Missions" is Field Notes' first space exploration-themed limited edition, though the company earlier offered a moon-themed "Lunacy" pack in 2016 and "Night Sky" set in 2013. A Field Notes-branded Fisher Space Pen is also currently available. For more information or to order the "Three Missions," see Field Notes' website.